Functions with two channels enable performing high-resolution differential measurement. Real-time data (with time stamps) can be recorded into the internal flash memory, transmitted via USB or Bluetooth to a computer, or written as html-pages for the online data plot in internet. The needle- or surface- electrodes are used to receive signals from plants. The system is fully autonomous and can operate without user intervention. 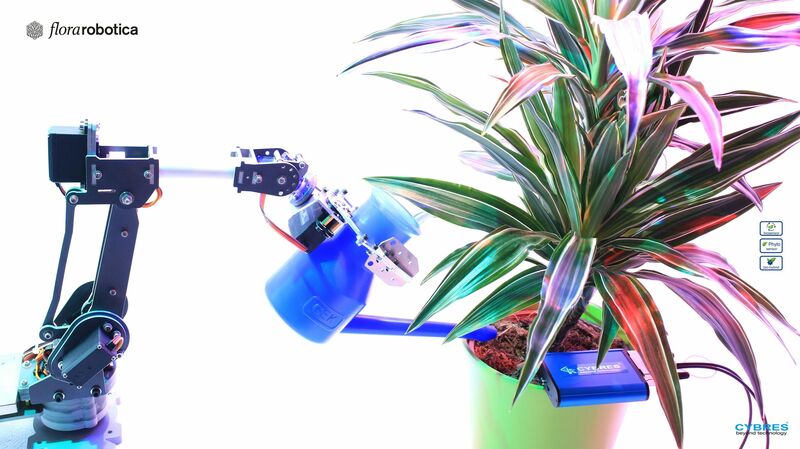 In addition to phytosensing, the device can also perform phytoactuation, i.e. to execute real-time data processing and decision making for operating different actuators. 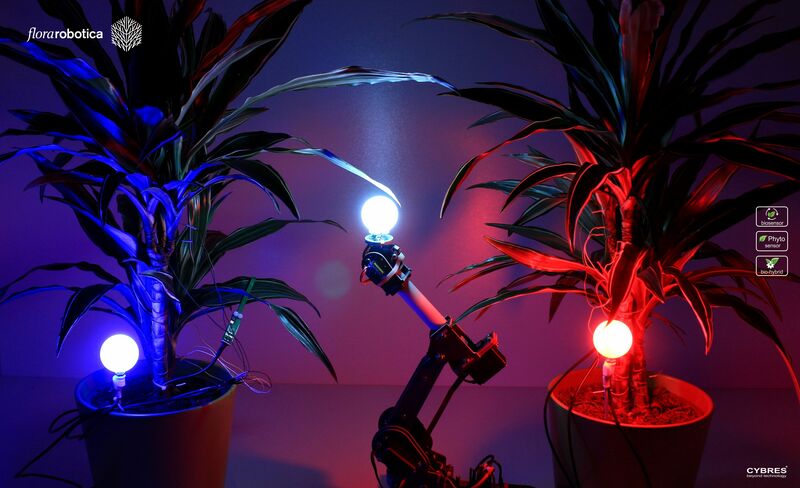 This functionality is useful for electrical or light stimulation of plants (blue/red light stimulation), optimizing watering and lighting mode, conducting fully autonomous experiments and development of complex feedback-based and adaptive scenarios with bio-hybrid systems. It possesses built-in semiconductor relays (switches) e.g. for RGB LEDs or water pumps, and can actuate any external USB relays. The system implements dynamical mapping between embedded signal detectors, numerical processors and actuators with reactive, probabilistic and homeostatic decision mechanisms. The phytosensor is a part of CYBRES bio-hybrid interface devices. Applications. This system is designed for professional and amateur purposes, as a tool for biological laboratories, and for plant enthusiasts. 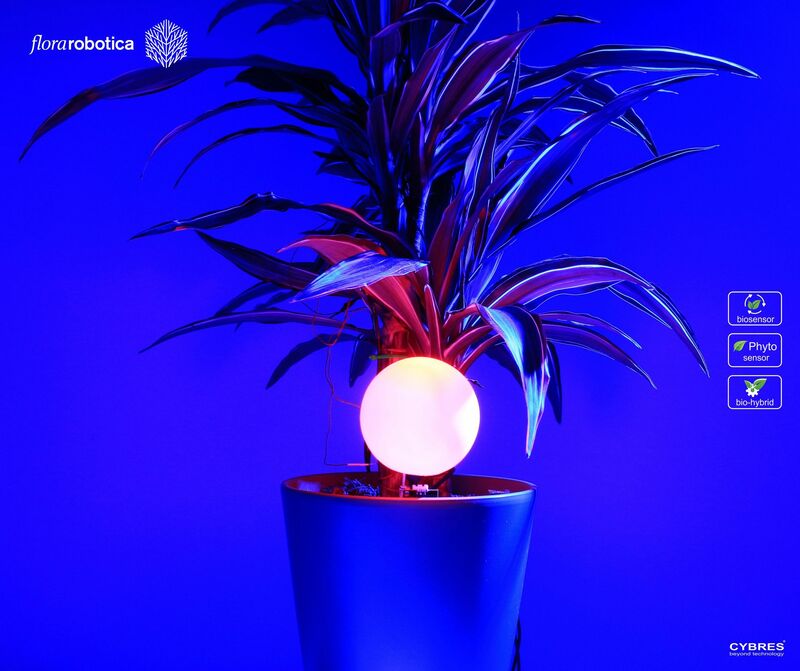 In the professional use this system can be employed to study the electrical reaction of plants, as phyto- or bio-sensors, in the bio-hybrid and robotic systems, for biotechnological processes based on phyto-objects. Additional algorithms for data analysis and actuation can be easily implemented with the provided script language. In amateur applications the system has a variety of potential usages, for example, in school or university courses on biology, for studying 'the electrical language of plants', or to carry out experiments in the context of Cleve Backster and Peter Tompkins works with the 'Secret life of plants'. In the minimal version, users receive access to all electrophysiological functions, can record, analyse and perform phytoactuation based on electrical responces. There are several pre-programmed behaviours such as 'singing plants' or 'talking plants' - converter of biosignal to music and speech. Users can flexibly program reactions and voice dialogue. Plants are very sensitive to a touch and 'presence' of a person, maybe that the flower will be able to recognize you and 'express a joy' about your arrival. The delivering set includes the MU3.4 module, bio-potential/tissue-conductivity electrodes and the sensor panel with several environmental sensors. In the extended configuration, the system is configured as an indicator of biological pathogenicity of the environment. It can measure separate parameters (e.g. CO2 or EM emission level) or a 'complex biological pathogenicity' - a combination of different parameters that affect the metabolism (e.g. geobiological situation and cosmobiological factors). The system needs about one-two weeks to adapt to the plant, its signals and to calculate the correlations with other sensors. For instance, the green LED indicates a normal signal level of the plant, yellow - the deviation of current parameters from a 'normal', red - the critical state. The main purpose of this system is to attract attention to possible biological pathogenicity on early stage. In this configuration the phytosensor is capable to operate without a connected PC/laptop. The delivering set includes the MU3.4 module, bio-potential/tissue-conductivity electrodes, the leaf transpiration sensor, and the senor panel with several environmental sensors. In the configuration for professional users, the device provides access to all obtained data and allows their algorithmic, mathematical and statistical analysis. 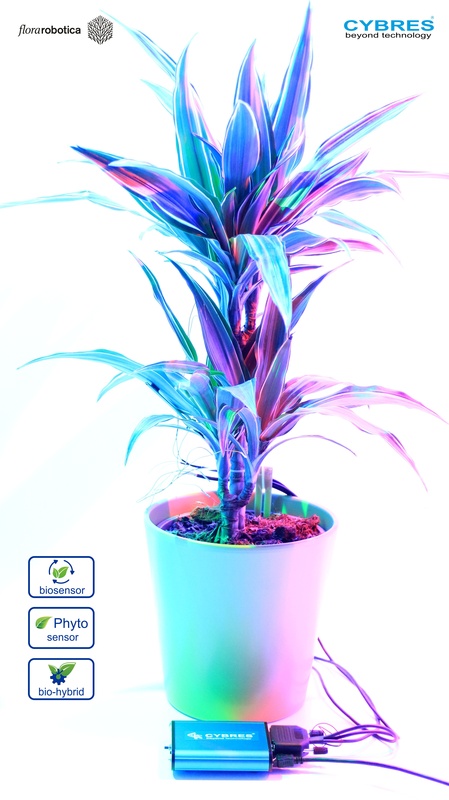 This mode is useful for optimization of plant's productive functionality, for using plants as biosensors, including weak signals, human psycho-emotional influences and unconventional instrumental detectors, as well as for scientific research of the world of plants. In particular, it can be used to explore the leanring and adaptation processes in vegetable and bio-hybrid systems based on plants. The delivering set includes the MU3.4 module, bio-potential/tissue-conductivity electrodes, the leaf transpiration sensor, the stem's sap flow sensor, and the senor panel with several environmental sensors. Optional electrodes in this version include electrodes for trees/shrubs. In this configuration the phytosensor is capable to operate without a connected PC/laptop also outside (with IP65/66 water protected package). Мое имя Флора. Я растение. от CYBRES на Rutube. Copyright © 2019, Cybertronica Research.